It costs nothing, but has immense value. It’s something we love to receive, but often forget to give. When I was 13 I was going through a phase where I was confused and angry. I’m sure everyone has had a phase like this, but at the time I felt like I was the only one who had ever felt that way. I wasn’t a little kid anymore, but I wasn’t old enough to get my drivers license or vote. I had lost people who had always been in my life and I felt mad at the world for taking them from me. I just didn’t have it in me to exude kindness every day I got out of bed. My family has always been so loving and kind; I cannot imagine my life without them. They showed me love and kindness, understanding, and empathy in the times I needed it most. In the darkest times I was shown kindness. Now that I’m out of that dark time, I reflect on it and see how my family’s kindness and warmth helped me find the light at the end of the tunnel. Now I hope to be that light and kindness for others. Everyday we’re supposed to choose to be kind. Some mornings I don’t want to be kind, I want to be resentful and bitter. Some mornings I compare my life to other people’s. Some mornings I wonder why people who continue to intentionally hurt others get the “easy way” in life. But, I know that as a human being I never will have all the answers. Think about Jesus; He was persecuted and sent to the world to die, but that didn’t change how kind He was. He still loved His enemies as if they were His friends. Use that as an example for yourself the next time you’re having a hard time being kind to someone. Maybe that someone is even yourself! The world can be a harsh and cruel place. A drop of kindness can go such a long way and make you and the person you showed it to feel 200% better. I’m a firm believer in give good, get good. Be kind, get kind. Lastly, I want to point out that it is never too late. You can always be kind! Even if you don’t have a good history with somebody, that’s okay! There might be a bad history, but you can help make a good future. Showing someone you genuinely care is truly priceless. That’s all on the topic of kindness for today. I hope you guys enjoyed this post. I know it was kind of long and didn’t have a lot of pretty pictures, but I’m learning that that’s okay. This post is meant to send a message. A message for others and for myself too. You are such a light! Thanks for sharing your thoughts and your journey. God is so good. Amazing message Edye! You’re so sweet! Thank you so much, Lynne! Helping others and being kind is such a beautiful thing to give and to receive. I hope you have a lovely weekend as well. This is a beautiful post. Being kind is so important and it’s definitely one of the most important qualities I’m trying to install in my kids. (Hopefully by example, although I don’t always succeed.) One of the things I try to do most when I’m feeling less… charitable, is to try to put myself in someone else’s shoes. Kindness is so important, I think however someone treats you, you should always be kind to them because you don’t know what kind of day they’re having or what they’re going through and not being kind to them won’t help anyone! Lovely post. Kindness is such an important trait to have, and you know what, it takes no talent or effort at all! What a blessing to have a kind family that showed you a happier way. A great message! Such a beautiful post! 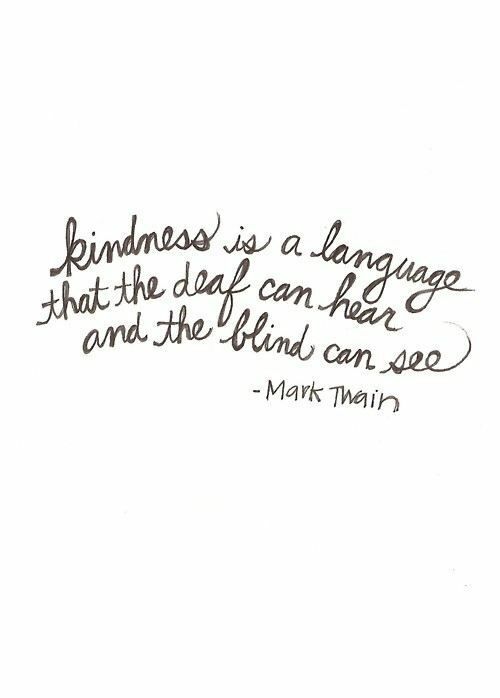 I totally agree: Kindness is a language! Kindness heals the world and should be spread!! I always, always try to be as kind as possible! I don’t understand people that are rude to others at all. Kindness is simple and easy and free and doesn’t take any more effort than it does to be mean. Great post–when im feeling judgmental or unkind toward someone I tell myself that i dont know exactly what things people are going through. Thanks, Heather! I do the exact same thing. We always need to consider what others are going through before being so judgmental. Such a good message, lady- and one we can all refresh ourselves on every now and again. 🙂 Thanks for this! "a single act of kindness can cause ripples of healing"
And kindness is free. Sometimes I struggle. I let the resentment surface, for a time, because it doesn’t take long to realize that holding back kindness hurts no one but me. Sharing it helps everyone. Thank you for such an inspiring post. Yes, kindness is free, Joylene! Thank you so much for reading and for your kind comment. I’m so glad you enjoyed the post ❤ Have a lovely week! Edye, what a lovely, thought-provoking post. Thank you so much for sharing it at the Over the Moon Link Party! You are my choice as Featured Blogger this week. Come back from Sunday evening through Thursday evening to grab your Featured Blogger’s badge. I remember that 12-13 era, when I was pretty b*tchy to my parents. I try to give people the benefit of the doubt, even if they come off to me as mean or thoughtless, as they may have not realized what they were doing, and may have bigger things on their mind than just how they appeared to me/ what they said to me. This has worked out really well too for me in not taking things so personally! A beautiful message for everyone! Thank you so very much, Leslie! Hope your week is going well thus far. What a great post! I try to teach my daughters kindness and it warms my heart to see that they’re really listening! Thanks so much for sharing with us at Share The Wealth Sunday! Thanks so much, Lisa! That’s amazing that you’re teaching your children about kindness; it’s a wonderful quality to have.